We all need inspiration and good business advice in these hard times. So I have been combing bookstores for leading-edge thought leadership from the great business experts. Many of the most popular books seem to originate in the USA. But isn’t that the place that’s the source for our current misfortunes? Never fear! At last, I have found a book by a British motivational guru, L Vaughan Spencer: Don’t Be Needy, Be Succeedy, The A to Zee of Motivitality. Spencer made his fortune in the refrigerated transport business, and is now Business Ambassador for the South East England Tree Fellowship and Acme Products Ltd Visiting Professor of Succeedership at the University of the Isle of Wight. His list of published books is very impressive and includes seminal works such as Chicken Nuggets for the Soul, The Seven Hobbies of Highly Effective People and Who Moved My Cheeseburger? Strangely, I could not find any listings for these on Amazon, so called the number on his website, the ‘Succeeder Hotline’. I had a conversation with a member of his staff, who explained that the lack of availability of many of his published books was the result of a conspiracy by a number of people, including a rival motivational speaker. It was a long and interesting story. A few months later, I discovered that the hotline was in fact a premium rate number and the call had cost me several hundred pounds. I sent an e-mail to complain, and eventually received an answer from the great man himself, saying that legally I had agreed to a ‘Virtual Vaughan Session’ and I was at fault for not sending him a photo of myself and buying another book for a friend, which was apparently all part of the process of learning how to succeed. The conversation became quite heated, so he offered to convert my payment into a free place on his Business Boot Camp. He also said that anger is ‘vital in today’s FMBE (Fast Moving Business Environment)’, and explained that the Boot Camp would be a perfect place for me to express my pent-up anger and channel it into business success. The day started with Moisturiser, which Spencer explains is ‘vital in today’s FMBE (Fast Moving Business Environment)’, quoting ancient French Canadian wisdom, which translated as: ‘Man with dry face no win big deal.’ When I pointed out that many women are very successful in business, he claimed that this proved his point and directed me to his own range of skincare products. The next part of the program was called ‘Movement and Dance’, which involved us moving around to very loud 70s disco music, with Spencer himself encouraging the female members of the workshop to loosen any constricting items of clothing. 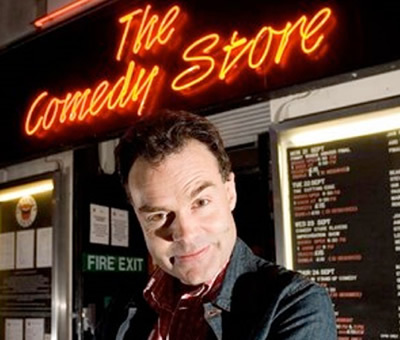 L Vaughan Spencer is, of course, a spoof, the creation of Neil Mullarkey, one of the founders of The Comedy Store Players. But like all good satire, his barbs are unnervingly close to the mark, especially for people like me whose day job involves inspiring audiences. It is very easy to be cynical about the neo-religious fervour stirred up by motivational speakers; a friend of mine once referred to their events as ‘hope for the hopeless’. It is certainly true that some people spend money they cannot afford on ‘get rich’ programmes, which succeed only in increasing the wealth of the speaker, rather than the audience. But on balance, I am in favour of anything that lifts the spirit. For every sceptic there are many more people who do get real value from the programs, otherwise the genuine L Vaughan Spencers would have been put out of business years ago. My recommendation is not to follow their models slavishly, but to use them to add perspective to your own experience, and hopefully learn from your mistakes and build on your successes. All the motivational speakers have the same basic themes: you need to take personal responsibility for your own situation rather than blaming others; you should take action rather than prevaricate. L Vaughan Spencer returned to his native Britain after a lengthy sojourn in Canada where he built a huge following and massive reputation as a personal growth guru. In 2004, he was named Business Speaker of the Year for Bedfordshire and Hertfordshire and came 12th in the Northern Hemisphere Motivator of the Year (Under-40 Middleweight Section). He is the chief executive of the L Vaughan Spencer Foundation, a not-for-much-profit organisation dedicated to its betterment and of Succeeder Solutions who provide ‘bespoke solutions to tricky problems’.